I don't think either of those statements are correct. It really doesn't matter; all of the active Democrats and Republicans combined are less than 20% of the American population. Most Americans (especially the ones with families and children) are concerned about good stewardship of the environment, but we do not believe that we can control the weather. The one thing that we all know for sure: Democrats hope to gain votes and influence by exploiting our fears about the weather and promising that they can fix it. It is surprising that the Obama Administration does not have an energy policy. It seems like that would be an easy area for him to display some leadership and innovation. With all the abortions and gays how can this be? As for the enviroment, what is your thinking here? Some do but others think maybe we have already screwed the pooch. I don't think anyone of the ruling class believes that we can alter the course of the weather. But that does not stop the opportunists and profiteers from crowing: "Forget about our mounting debt and collapsing culture..... Vote for me; I can change the weather! And I'll fold your monthly contraception expenses into your insurance plan too, so you'll think it's free!" Personally, I am not convinced that human activity is the cause of global warming.... there have been hot periods and ice ages before there were humans. But if greedy moderns have really have triggered a global event by releasing several million years of fossil fuels over the last two centuries, then I agree with the screwed poochers: There is probably nothing we can do to stop it now. Regardless of the cause, we should start making plans for rising oceans. The good news is that the sweet spot for agricultural productivity will move to the vast steppes of Canada and Russia. With a warmer earth, we will be able to feed many billions more people..... if we are charitable enough to share. Our culture is not growing in charity as we abandon those pesky Christian virtues. And who was the lucky goat who went around putting thermometers on each planet to take measurements similar to the ones on earth? (Minus the peculiar location choices..? Contraception prevents more children than abortion. And conservatives contracept at the same rate as liberals. Every couple has two kids. There's really not much difference. It's like everybody's mostly gay. I'd like to think that conservatives marry and stay married more than liberals do. That's why conservatives tend to be middle class families, while liberal voters tend more toward poverty and single-parent homes. Cows naturally graze on grasses, the end result is methane, methane dissipates in a mere 11-12 years. Grass fed cattle can be fed on land not suited for intensive planting of crops. Of course, feeding 10+ billion people on this planet will be a problem no matter what. Nothing in nature holds our populations in check and science has stopped many of the diseases that used to do so. The only likable solution I see is birth control. Families with one or two children are beautiful too. Birth control is only a likable solution to some. Maybe an uncommon abundant population will still be handled by nature despite science. Death by climate change. Nature has a way of righting herself. The Top Men and Experts all seem to have a hard on for de-population theories. I'm surprised no one has advanced the idea of accelerating climate change in order to do it. Maybe if they rebrand climate change as a de-population theory the idea would become more acceptable. They could preach that climate change ought to be embraced rather than resisted since it will reduce the amount of people and therefore reduce the amount of factors guilty of changing the climate. Thats a great idea! It would also help eliminate millions of factories that produce major carbon footprints. With the 2015 publication of "Laudato Si', on Care for Our Common Home," Pope Francis' ecological manifesto, the Catholic Church stepped powerfully and clearly into the now-decadeslong public conversation about the state and future of our planet, the role of the environmental movement and our understanding of the human's place within creation. By now, we hardly need to rehearse the litany of eco-woes we face — deforestation, urban sprawl, disappearing topsoil, freshwater shortages, climate change, the sixth mass extinction, and more. Yet three recent books help not only to clarify such challenges, but also to point the way toward the cultural and ecological health that Francis calls for. Of all the important voices in the critical dialogue spanning the last two generations, there has been perhaps none more steady, eloquent and significant than that of Kentucky farmer-poet Wendell Berry. Since 1960, Berry has published poetry, fiction and nonfiction essays — more than 40 in all. In his latest, The Art of Loading Brush: New Agrarian Writings, Berry's many fans will be pleased to find here all three genres. Fundamentally, each of these books, while different in many ways, suggest that the way out of our deep cultural and ecological crisis is through a spiritual connection to the land. In a movement increasingly obsessed with policy changes and science, these three writers make pleas for relationships, for spiritual groundedness, and for embodiment amid the march of industrial progress. May we listen deeply to these voices as we navigate the most important, far-reaching conversation of our age. This is not hard to understand. People tend to decide how many children they have according to what their habitat dictates. Housing, time, education costs, transportation, class life style and so on. People normally don't have children to accelerate financial failure. They don't normally have children to outgrow their homes. They have children when they reasonably believe they can handle the increase because of the increased benefits children can provide. No one will suggest that we increase population to destroy our earth to reduce population. I am not going to run the air conditioner in my office or home until I absolutely have to. (At home, that means until the complaining from the kids gets unbearable). Nope. 80 degrees at 50% humidity and climbing. I figure, we've gone soft as a species so this is my way of testing myself for the greater good. I should save some money too. And be better able to enjoy outdoor activities because my body will be used to it. I might have pit stains and smell slightly of liver and onions, but it will be worth it. If previous generations lived without AC, I should be able to as well. Grunt grunt. You're likely correct. People who hate people want to get rid of them as quickly and efficiently as possible. They can't stomach the long haul. Nor can they risk a theory like that being false. But never say never. We may get someone in power who uses that tactic without showing his cards. I wanted three kids. My wife said, “no” for good reason. So we have two and I’m perfectly content with it. The freedom to have big families is very important to some people, though they may wish to consider the environmental aspect of population. Though practically speaking, the markets do more for putting limits on birth rates than ultruistic planning I think. My point of “likable” solutions in reference to population control is only in comparison to alternative ideas. Other potential “likeable” ideas are cultural changes in lifestyle that use engineering and technology to lesson human impact. To a degree that would work too I think. I don’t believe there is a static number of people that make up a human population carrying capacity. One of our attributes as humans is our ability to create habitat for ourselves and other forms of life and being able to manage it. We use those same attributes to destroy the earth too. We have to be smart about it. I live in big metropolitan areas. I don’t like it most of the time. I have witnessed too much destruction to the earth because of human expansion. I see problems in culture and the markets from the way people do cities. I’ve seen too much pollution from people to believe that we don’t have a problem with high population rates. I’m sure the solutions are many, not just birth rate control. Too much of that can lead to other problems too. Balance, it’s all a balancing act. Pope Francis with the General Assembly of the Pontifical Academy for Life in Vatican City on June 25, 2018. Credit: Vatican Media. Vatican City, Jun 26, 2018 / 12:31 am (CNA/EWTN News) — A healthy human ecology begins with a respectful and holistic view of the body as God created it, Pope Francis told participants of the 24th General Assembly of the Pontifical Academy for Life. 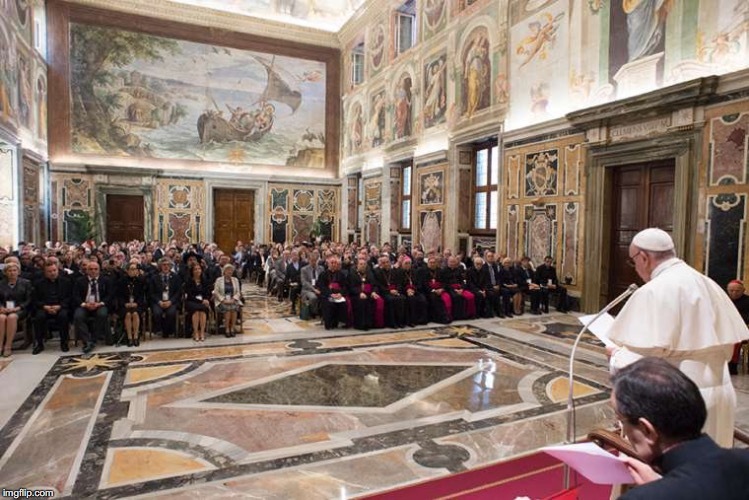 “In a holistic view of the person, it is necessary to articulate with ever greater clarity all the concrete connections and differences in which the universal human condition dwells and which involve us, starting from our body,” the pope said. In his comments, the pope discussed the importance of understanding the human body as a starting point for further reflections on human ecology. “The acceptance of our body as a gift from God is vital for welcoming and accepting the entire world as a gift from the Father and our common home, whereas thinking that we enjoy absolute power over our own bodies turns, often subtly, into thinking that we enjoy an absolute power over creation,” he said, citing his 2015 encyclical Laudato si'. Pope Francis encouraged those present to root their understanding of human ecology in a true understanding of human dignity. Man, it's a good thing they saved all that money by not investing it into pseudoscience climate prevention scheme. Sounds like wise financial thinking to me.